Look on the links page for Surname Info. 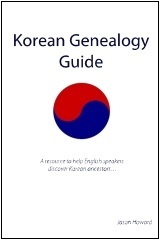 Its a website with information about Korean family names, including lists of clans (GongPa) and HanJa characters used in the first names of each generation (HangRyeolPyo). If you don’t know which clan record to look for, you can sometimes narrow it down by finding one of the HanJa characters of your ancestor’s name in the HangRyeolPyo on this site. It can give you a lot of clues about where to look for your ancestors if you only know their name. Here is an interesting tutorial on Korean names. Do you know of good resources to learn Korean? The Handbook of Korean Vocabulary is excellent. It organizes words by common roots, which is the best way to expand your Korean vocabulary. Just found a really old jokbo at Centre for Korean Studies Materials http://www.kostma.net/?lang=en. I haven’t gone through the site but it looks really interesting. There’s a link to “Archive of Old Manuscripts.” The link to the jokbo came up in a google search and is at http://www.kostma.net/FamilyTree/PersonView.aspx?personid=pd025454&person_uci=. Looking at a Korean Geneology book. Many names have a second name, and a Korean referred to this second name as ‘Ho”. Example: Name is listed as Lim Moon Do (Che Kyoung). A second example is Lim Kan Taek (Nak Jung). Any help on the meaning or purpose of the second name in parentheses? I have also seen two names in some genealogies during some time periods. I am also searching for more information about that practice. So far I have learned that kings were given a name at birth and a new name at the temple and as a reigning king they were known by the new name. I’m curious if that is similar to the other records of people with two names listed or if it is a reference to a parent or something. Hello! Do you have any idea where do UMs from? Or what’s their ancestral history? Great site btw. I have met an iron door of no access to start genealogy on my maternal side. My mom, I believed spelled Suk Cha Yu married my dad and moved from Seoul to the states by because their marriage failed and for other reasons she cut herself off from me when I was a child. Can anyone tell me anything or point me in the direction of finding more out about her maiden sir name, YU? Hello, I am your mothers sister, my name is Suk Hee Yu. I may have some information for you if you can provide an email address. Hi, my name is Sandra and I am trying to find my family in Seoul. We left Korea in 1983 when I was 7 years old. My mother’s name was Noh Hui Chi. She had an older brother, Noh Jae Jin who had 5 sons and 1 daughter. My mother had an older sister, but I don’t recall her name since I called her Emo. She had 2 daughters and a son. The youngest was my mother’s brother, Noh Jae Sun. He had 2 sons and 1 daughter. My grandmother was a Buddhist monk that lived in Incheon. I have a book of my ancestors, but it is all in Korean and I can’t read it. What can I do to find my family? Wow. The family JokBo is such a precious document — how luck you are to have it. That will help immensely. What do I do with it. It is in Korean. It also has a picture of one of the Korean Presidents, Noh Tae Woo. Would that mean I am related to him? I am at a loss. Thanks! I sent you an email to coordinate sending a picture of the Korean book to help us you get started. Did you get it, or should I send it to a different address? I sent a picture of the book. Thank you!!! Hello, I’m searching for my mother’s 2 sisters who were given up for adoption when she was 5 years old in Korea. When my mom was 5, her mother, Chong Ok Choe, passed away and for reason’s unknown to her, her father, Pyong Ok Kim, gave her older and younger sister away. Old paperwork she has lists her sisters names and DOB’s. She has no idea if her sisters ended up together or were separated. If they were separated, the youngest may not remember anything, because she was approx. 1 years old when their mother passed. Any useful information to help in finding them would be appreciated. Trying to find out more on Hwangbo (my grandfather’s last name). Only saw the stuff on wikipedia about a PM and some kind of queen but I don’t know if that’s at all related. Want to know if all Hwangbos are related or is it like a “Smith” thing? my greetings admins, i grew up without a father and through all these years i have been very curious as to what’s going on in his life? is he healthy and safe? because my mother lost connection with him since i was just months old and they met in my country, the Philippines in waterfront cebu. his name is Jo Heung Park and i was hoping that it’s not too difficult to find him despite the similarities of thousands of names out there and suprisingly i found his facebook. great news right? so we have a couple of pictures of my dad and my mother but they were never married and the profile picture was exactly the same! so i added him but much to my dismay he never accepted the request and even took off his profile picture. and it was the only picture in his page. i also tried talked to him on messenger and sended pics yet i never received my reply. the description says that he lives in incheong taiwan now and im certain that he is on his golden age since when my mom got pregnant with me he was already 40 plus? i assume and i really hope that your team can locate me to him although im still very young i wish to see him and have a conversation. if any of you readers, admins may help or have information through anything that is related to his life i would really appreciate that and be thankful. oh and my contact number is (Philippines) 09158514978 or 09562710658 God bless and i hope i receive help and peace 🙂 please do not hesitate to contact me. I’m in Search of my Grandmother that lives in Seoul Korea. Her name is Song Cha Chang born on March 15th 1949. I have more info on her just need to find the right place to start and I don’t know where . Someone please help thank you.